This the first image upload I have attempted. Coming from a mechanical age digital language can be a challenge. An aside I might note. 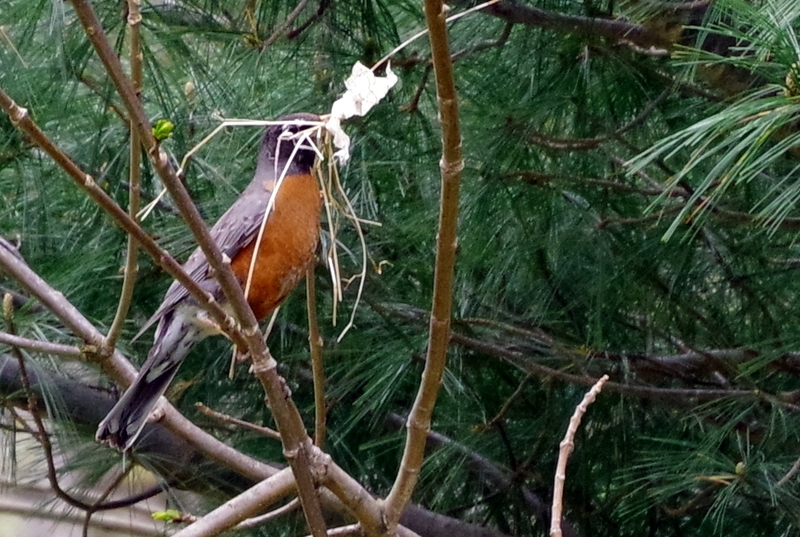 The weeds in the robin's beak gave me my first experience with moire as messed around with resizing. You pass "the test" with flying colors! Nice Shot! Thanks Bob. The test was to see if I could get it to appear. I may have it figured out if I can remember just what I did. I did not think the shot was half bad, maybe a bit soft. It was hand held, 210mm with the 55-300mm PLM, full auto. I enlarged and cropped with GIMP and let that program auto adjust white balance. Moved it to Irfan to save it in an acceptable format for this site. It is all new stuff for me. There is probably a better way that I will stumble upon. With my point and shoot I would just email, Facebook, or post on my blog the 3-4M photos. You can "export" it directly from GIMP to jpeg (or another format), without having to use Irfanview. also since you're using free software you may want to try RawTherapee, and lightzone also. I do have Raw Therapee and although it is a bit intimidating I have been playing with the features with my first excursion into using RAW. I will look at GIMP for converting to web acceptable sizes. I suppose I was taking the road that I was familiar with. Thanks! Darktable is also a good alternative/compliment to Rawtherapee and there are plenty of tutorial videos on YouTube.